Neville Southall believes John Toshack deserves some credit for Wales' recent revival and rise up the Fifa rankings. 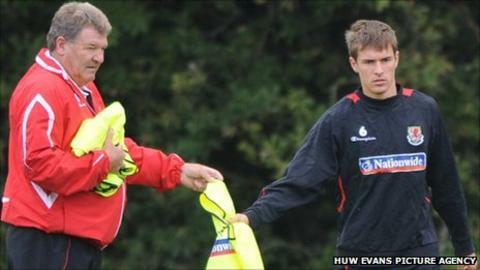 Southall says current manager Gary Speed is reaping the benefits of Toshack's youth policy when in charge. "Whatever you say about Tosh, and I wasn't his greatest admirer, he went with the kids and gave them so much experience," said Southall. "We're bearing the fruits of that now and I feel we aren't too far away from qualifying for a major tournament." Toshack fast-track the likes of Gareth Bale, Aaron Ramsey and David Vaughan into the senior side after many of Wales' established international chose to retire during his reign. Those players are now at the heart of Wales' resurgence under Speed, highlighted by back-to-back wins over Switzerland and Bulgaria in September. A remarkable leap of 45 places in the world rankings to 45 followed, but Southall says he always had faith in the younger generation to come good. "I wasn't like everybody else, I thought we do well because of the amount of good, young players we've got," said Wales' most capped international. "The past four years have been a lot rosier than people make out. Welsh people tend to have the glass have empty instead of half full. "The age-grade teams are doing well, schools football is getting better. Everything is on the up, it just needs that final push now." Southall believes Speed has made two important decisions since succeeding Toshack in December 2010. The appointment of Dutchman Raymond Verheijen as assistant manager indicates his intention to implement the "Dutch way" of technical, passing football. And Arsenal play-maker Ramsey, he says, is the ideal choice as captain to fulfil that philosophy on the field. "He's not the biggest shouter in the world but he leads by example. He's getting better and better," said Southall. For all his positiveness over Wales' future under Speed, Southall acknowledges that a proven goalscorer is the one key ingredient missing. And that problem would become even starker, according to the former Everton goalkeeper, if Craig Bellamy decided to retire. "If I was the Wales manager I would be round Bellamy's house now asking him to keep going for another four years," said Southall. "He'll go on until he feels he's ready to quit. He's a severe critic of his own game. "For me he's been the most under-rated player Wales have ever had. "He's far better than what people give him credit for because of the all the other stuff that goes on around him. "I'd rather a player like him in my dressing room that moans and moans when things aren't right. "I'd rather that than a player that says 'yes boss, no boss'."